Whenever a lawn develops excessive thatch, it requires dethatching, but the best time of year for the chore depends on the type of turf grass. Thatch is a layer of decaying and dead plant debris including grass roots, shoots, stolons and rhizomes -- sideways-growing roots and shoots -- that builds up in a lawn over time, reducing the vigor of the grass. Grasses that spread through stolons and rhizomes build up thatch more quickly than bunch-forming grasses and require more frequent dethatching. A lawn with thatch thicker than 1/2 inch requires dethatching. A layer of thatch thinner than 1/2 inch is beneficial to a lawn because it insulates against temperature changes and improves the lawn's wear tolerance, but a thatch layer thicker than 1/2 inch harbors pests and diseases and reduces the turf's tolerance to heat and drought. A thick thatch layer also encourages the grass to root in the thatch layer, creating weak-growing turf that requires intense management. The first sign of thatch buildup is a lawn that feels bouncy when walking on it. To measure the thickness of a thatch layer, cut a small square of lawn 3 inches deep and measure the brown layer between the soil and the green grass blades. The best time for dethatching cool-season grasses is the early fall. Dethatching damages a lawn, and grass needs 45 days of favorable growing conditions to recover. Cool-season grasses stop growing in summer, so dethatching cool-season turf grass in spring limits the time the grass has to regrow. Another benefit of dethatching in fall is that fewer weed seeds sprout in winter than in spring. Cool-season grasses include Kentucky bluegrass (Poa pratensis), which is hardy U.S. Department of Agriculture plant hardiness zones 2 through 6, tall fescue (Festuca arundinacea -- USDA zones 4 through 7) and perennial ryegrass (Lolium perenne -- USDA zones 3 through 6). Perennial ryegrass and tall fescue are bunch-forming grasses, so they take longer than rhizome-forming grasses to recover from dethatching, but these species usually only require dethatching every four or five years. Warm-season grasses benefit from early-spring dethatching. Dethatching warm-season grasses such as Bermudagrass (Cynodon dactylon), which is hardy in USDA zones 7 through 10, and zoysiagrass (Zoysia japonica -- USDA zones 5 through 10) in fall doesn't allow the grass time to recover before entering winter dormancy. Dethatch bermudagrass, zoysiagrass and other warm-season grasses in spring two to three weeks after the grass has greened up and when nighttime air temperatures are above 60 degrees Fahrenheit. Kentucky bluegrass and other rhizome-producing grasses often require yearly dethatching. 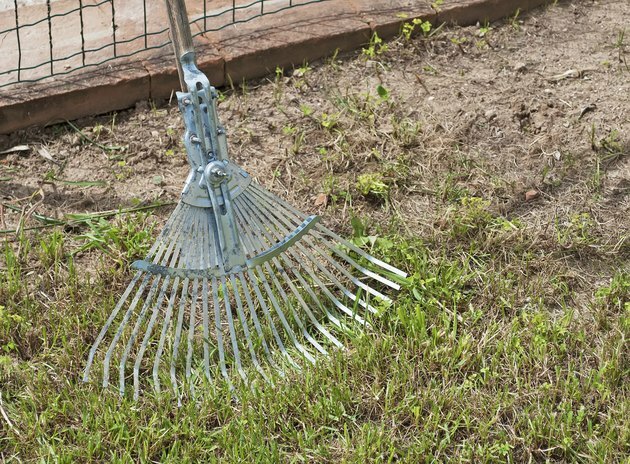 Power rakes are most effective at dethatching a lawn. Also called a vertical mower, a power rake is machine with a set of vertical knives or tines that scrape the thatch out of the lawn mechanically. Set the power rake so that it removes a small amount of surface soil as well as the thatch. Dethatching a lawn generates a large amount of plant debris that can be composted and used as a soil conditioner. To help a lawn recover, apply a light fertilizer dressing, such as 10-0-5 applied at a rate of 8 ounces per 100 square feet, or according to the manufacturer's instructions. Irrigate thoroughly after applying the fertilizer, and water the lawn regularly so that the soil is constantly moist but never sodden. Avoid overfertilizing a lawn because this can cause excessive thatch buildup.